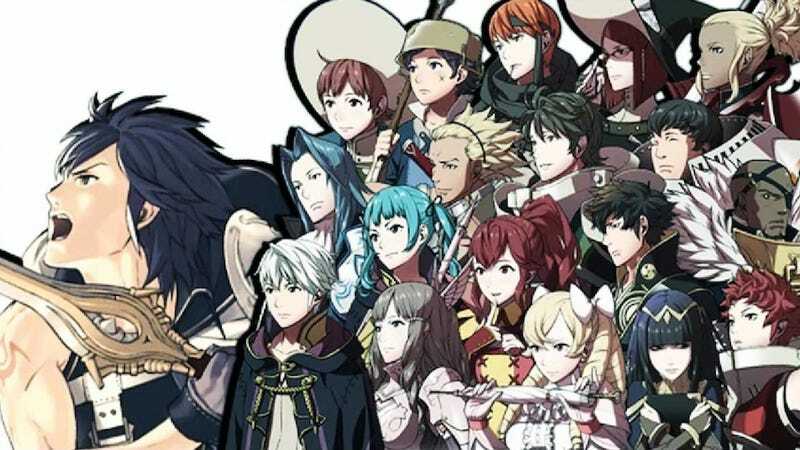 The grand finale of Fire Emblem: Awakening made me feel things. Emotional things. In fact, it made me feel so many things it kinda knocked me out. This was unexpected. It took me about 27 hours to complete the game. If, about halfway through, you had told me that the ending was going to make me feel proud and sad and thrilled and bittersweet, I wouldn't have believed you. That's because halfway through, the story seemed like total nonsense. It was a mess of warring kingdoms with gobbledegook names, prophecies that didn't make sense, mysterious doppelgängers and all sorts of time-traveling nonsense, all hinging on—you guessed it!—an ancient evil, poised to awake. But somehow, over the course of the final three or four chapters, Awakening pulled it all together and delivered one of the most cathartic conclusions of any game I've recently played. Spoilers follow for the end of Fire Emblem: Awakening. Looking at the story going into the final showdown with the evil wizard Validar, it all seemed way too convoluted to ever come together in a meaningful way. It seemed unlikely that this many threads could make a single tapestry. But right around the time when Shin (my red-headed protagonist, who happens to look exactly like Sentarō from Kids on the Slope) and his best friend Chrom faked out Validar by reenacting the fateful vision from the start of the game, the story got some real traction. What initially seemed like a plotline from Passions (Time-traveling children! Evil twins! Demonic blood!) actually wound up making a fair amount of sense, or at least as much sense as any time-travel story can. See, it turned out that my amnesiac protagonist was actually Grima, a massive dragon demigod monster who is the key to all evil in the world. (Aren't they always.) A good all-powerful dragon named Naga explained that in order to defeat his twin, who had traveled back in time to ensure that Shin became evil in this timeline, Shin would need to strike his future-self down—Grima can only die by his "own" hand—but in so doing, Shin himself would cease to exist. That was when I started to think, "Hmm, this ending might turn out to be pretty good." Not because the story was so original, but because I was getting an inkling that the game's designers were about to fall back on the thing Fire Emblem does better than almost any game of its ilk: It lets players control and become invested in the characters' relationships. In all our talk of this game over the past month or so, we keep coming back to one thing: Awakening is about smart, well-designed battlefield strategy, but it's also about love and friendship. As characters level up and get stronger, their relationships with one another also level up and become stronger. You arrange your characters on the battlefield according to who they're friends with, or falling in love with. And each time they successfully fight together, their friendship deepens. This is such brilliant design—it ties the "story stuff" to the "game stuff" in a way that makes characters more than just window dressing. It's a more complete loop than the well-regarded Persona games—not only does an increased social status make characters more effective in combat, it goes both ways: fighting well together improves their relationships. The side effect is that as all that happens, you really come to like them. Forget The Most Powerful Characters. Use The Ones You Like. So it's fitting that in the finale, it's your friends that carry you through. And boy, does that finale deliver. Here Shin stands, leading his battle-hardened squad of 14 of his finest warriors. Each one is armed with the finest weaponry and possesses the most high-level abilities, each one fighting hand in hand with a husband, a wife, a best friend. They've climbed onto the back of a massive, island-sized dragon, prepared to fight their way its head and kill it. But the dragon casts a powerful spell, and every character is instantly, gravely wounded. Then, Shin is sucked into a vortex by his evil twin and, in some dark shadowy in-between place, he's laid low. He's powerless to resist. Hope is lost. But then, he hears a voice. And then, one by one, his friends call out to him, bringing him back from the darkness. I was amazed—amazed!—at how genuinely caught up in all this I was. It's somewhat well-worn territory, of course: It's always darkest before the dawn, Trinity kissing Neo, Gandalf riding down the mountain at Helm's Deep, etc. But man... as "that moment" goes, it was really well-done. These people, whom I'd let risk their lives (because remember, in this game death has consequences), people whom I'd watched putter around in the barracks, celebrate their birthdays, train and laugh together, bicker and fall in love… they were all there, calling me back. And Naga healed my party, and it's once more into the breach, dear friends, up the dragon's back to land the killing blow and save the world. As I fought, that music was playing, and what a piece of music it was. I've written before about how Hiroki Morishita and Rei Kendoh's score is great, and the wonderfully shifting musical milieu of combat, but this final piece of music goes above and beyond. Like the story at this point, it ties together several of the score's motifs into something that's at once rousing, melancholy, romantic and energizing, and oddly sad. It's a play on the accordion riff that plays when you first meet Chrom and his shepards at the start of the game. The accordion represents so much in this game: friendship, unity, teamwork, sacrifice. But in this instance, the accordion is layered on top of a much more driving, heroic chord progression. And then, of course, there's a choir, because choirs are awesome. Despite the heroic anthem, it was a desperate, unwinnable battle. I was beset on all sides by an endless army of powerful enemies, and each turn would bring more of them. And Shin and Chrom made it to the dragon's head, and began their assault on Grima himself. Behind them, their compatriots held the line. Until they began to fall, one by one. The first loss was the biggest jolt—Frederick, who had been my overpowered protector in the early goings, was struck down. Then fell Kellam, the warrior that no one noticed—and without him to protect her, his wife Miriel died shortly thereafter. Frederick's wife Cordelia, now alone, was easy pickings for the unstoppable hordes. Flavia and her husband Basilio, late additions to my party who'd nonetheless had won me over during the course of the story, died as well. Then came the closing credits, a marvelous postscript to all that had come before. Through written epilogues, I got to find out what happened to my favorite characters. I learned that Virion was a pariah in his home country of Rosanne, but was forgiven because people were so impressed by his wife (and my favorite character) Sully. I learned that the animal-woman Panne was happy to accompany her husband Lon'qu back to his icy homeland, and that Donnel returned home to his mother and never fought in another battle. I learned what became of Chrom and his wife Sumia, and of all the characters that I didn't get to know that well, but who still fought by my side for a time. And then, one final footnote: that lovely, ambiguous cutscene. I awakened to see Chrom through Shin's eyes once more. A scene very similar to the one near the start of the game played out a second time, minus one very important detail—the mark of Grima was no longer visible on Shin's hand. That accordion was playing. "Welcome back," said Chrom. "It's over now." They'd found him, after all. And the loop closed. If you'd told me at the outset that I'd get this emotionally invested in Fire Emblem: Awakening, I wouldn't have believed you. It's fantasy malarky, I would've said. It's just dragons and spells, it's nothing I haven't seen before. That was true, after all: I hadn't seen it before, this was my first Fire Emblem game. I'd yet to experience the series' unique brand of emotional attachment. Now I have. So with the world saved, I did what any self-respecting master tactician would do: I loaded up a new game and started all over again. Maybe this time I'll focus on having a totally different party, and I'll watch new characters fall in love, get married, and fight alongside their children. I'll lead them in battle like I always do, and we'll win the day, like we always do. And when the bitter end comes, I'll have a whole new group of friends to pull me back from the edge before we plunge over it together.